And when you’re done, adapt some more. When it comes to working in Vision Therapy, there are lots of different angles of approach. None of them necessarily better than another, they’re just different. Some of us sit on the floor, some of us laugh and giggle, some of us are quiet observers, and some are direct and forthright. We are all people, after all, and our own personalities play into our approach with patients. One common thread that is fair to draw is that no matter our approach, we all love learning, and by extension, solving the puzzles before us which present in the form of the patients we see. Having moved around a lot in my adult life – since I started in VT, I’ve lived in San Francisco, San Diego, Houston, and now Austin – I’ve benefited from learning many different methods, different approaches, and have been able to observe some of the greatest patient care skills ever exposed in a VT room. I’ve also learned that no matter how much I learn, I will never know enough. One of the most valuable lessons ever shared with me is the reason for this post. It is, in my humble opinion, among the greatest skills a Vision Therapist can possess; although it is not often talked about, but no less important. That, my friends, is adaptation. 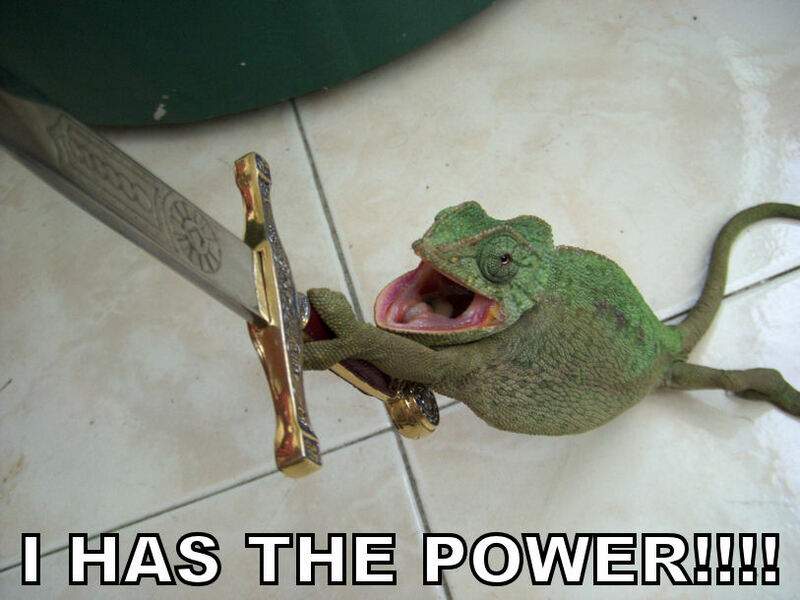 And who better to study when discussing adaptation, than chameleons. They are, after all, the masters of it. Chameleons or chamaeleons (family Chamaeleonidae) are a distinctive and highly specialized clade of old world lizards. The approximately 180 species of chameleon come in a range of colours, and many species have the ability to change colours. Chameleons are distinguished by their zygodactylous feet; their very long, highly modified, rapidly extrudable tongues; their swaying gait; and crests or horns on their distinctively shaped heads. Most species, the larger ones in particular, also have a prehensile tail. Chameleons’ eyes are independently mobile, but in aiming at a prey item, they focus forward in coordination, affording the animal stereoscopic vision. Chameleons are adapted for climbing and visual hunting. They are found in warm habitats that range from rain forest to desert conditions, various species occurring in Africa,Madagascar, southern Europe, and across southern Asia as far as Sri Lanka. They also have been introduced to Hawaii,California, and Florida, and often are kept as household pets. 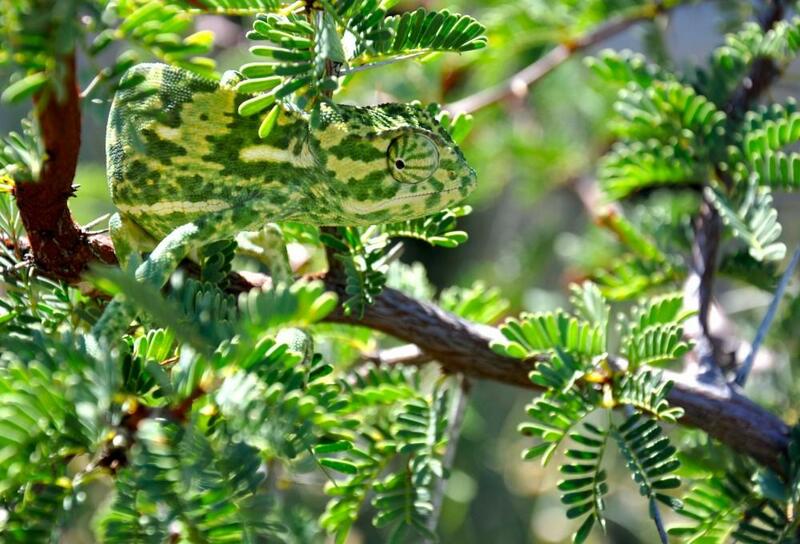 Some chameleon species are able to change their skin coloration. Different chameleon species are able to vary their colouration and pattern through combinations of pink, blue, red, orange, green, black, brown, light blue, yellow, turquoise, and purple. Color change in chameleons has functions in social signaling and in reactions to temperature and other conditions, as well as in camouflage. The relative importance of these functions varies with the circumstances, as well as the species. Color change signals a chameleon’s physiological condition and intentions to other chameleons. Chameleons tend to show darker colors when angered, or attempting to scare or intimidate others, while males show lighter, multicolored patterns when courting females. Some species, such as Smith’s dwarf chameleon, adjust their colors for camouflage in accordance with the vision of the specific predator species (bird or snake) by which they are being threatened. 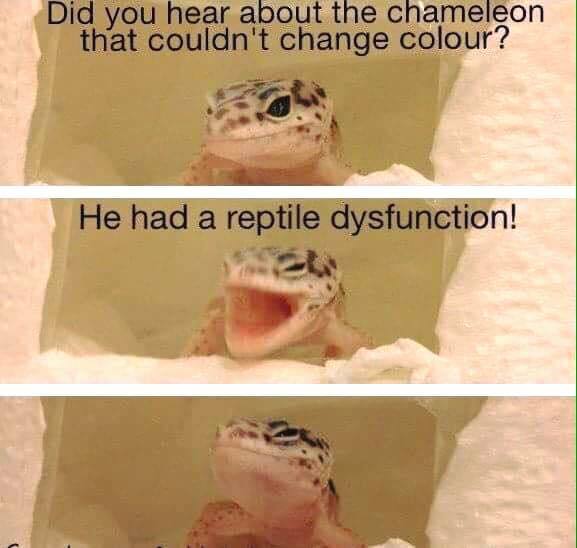 Chameleons are, by most accounts, amazing at adaptation. Whether they’re on the hunt for food, courting their next love interest, or hiding from an attacker, they’ve got it figured out. They’ve got the adaptation. Good Vision Therapy also requires adaptation. We cannot, of course, make our bodies change colors (although if you ever figure out how, please call me!) but we can change directions quickly, take three steps back in a hurry, find a different channel, move mountains while wearing a patch, and understand that we may be about to fall flat on our face. Our jobs require such skills to help our patients. We cannot, for instance, approach an adult TBI patient in the same manner as the 5-year old with Down Syndrome that just left the office. We cannot approach a teenage female with the same flavor of enthusiasm as say, an eight year old boy. They’re different people with different needs, and require different levels of communication and approach. It’s just how it works. Also important to remember is our approach with others in our profession. We are so lucky to have all different backgrounds and education levels available in our profession. Some were teachers, some were involved in emergency medicine, some were moms whose kids we helped, and some are just friends of friends whose qualifications fit the needs of their particular office. And do you know what makes our profession even better? It can be tough, at times, to remember that point. We get wrapped up in our daily grind of charts, which patient is on which visit, whose seen the doctor and who hasn’t, which piece of equipment needs our attention and we forget that working together with all different levels of education and experience is one of the greatest aspects to our profession. We can adapt to those around us who are learning, we can adapt to different models of treating a patient, we can adapt to a different line of questions, and we can even adapt to an approach which may be more effective than the one we’re currently using. Adaptation is a good thing, and if we’re really good at what we do, can be applied to all aspects of our job. Not just patient care. Dr. Larry McDonald once wrote: “The flexibility of your adaptability is the true measure of your capability”. We are strong enough to apply this wisdom to all portions of our office, not just when seated in front of a patient. Adapt for patients, adapt for co-workers, adapt for parents, adapt for referral sources, and adapt for anyone in between. Become a “Chameleon Vision Therapist”. No matter what comes our way, let’s adapt, because we’ve got this! Posted on July 22, 2015, in From My Perspective... and tagged Inspiration, Vision Development, Vision Therapy. Bookmark the permalink. 1 Comment. It was wonderful seeing Harry’s face. I do miss him and his contributions to our profession.